Loft Conversion. The creation of extra living space is the idea and purpose of many house extension these days. In most instances though, the preferred option is to undergo a loft conversion as it is more economical and not as structurally intrusive. 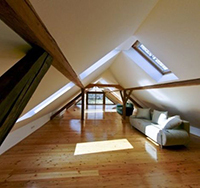 On staff, we have a full team of qualified specialists and experts, capable of carrying out all procedures related to the loft conversion.